Forget about browsing through Instagram while watching Netflix. Long awaited and highly hyped Black Mirror: Bandersnatch, which is the choose-your-own-adventure Black Mirror “event”, is definitely not like anything else in the series. However, it makes us uncomfortable about the concepts of technology and free will, while simultaneously being interactive and allowing viewers to select choices that guide them through numerous paths. Welcome to the post-television era. Reviewing something that does not have a static beginning, middle and end is a challenge. The Black Mirror instalment may be a great example of the era of streaming platforms changing the ways of watching television in 21st century. No matter if it was what you were expecting, Bandersnatch is undoubtedly an interesting “television”/streaming event. Set in 1984 (what one could treat as a nod to Orwell considering the “event’s” sci-fi thriller features), the plot focuses on a video game programmer Stefan (convincingly played by Fionn Whitehead) who attempts to create his own choose-your-own-adventure computer game “Bandersnatch”, based on a fictional novel. Depending on the viewer’s choices, various events will occur, but in almost every version, Stefan faces obstacles as he tries to meet a tight deadline set by a start-up gaming company while trying to overcome issues regarding his mother’s death, his father, mental health, conspiracy theories and the creative process. Whatever you choose, from seemingly unimportant decisions to literally matters of life and death, the plot leads you through different versions of numerous endings, on exploration of which you will spend hours. Yet, the concept of interactive approach is not that new. In 1960s, there was Julio Cortázar’s book “Hopscotch” that allowed readers to jump from one chapter to another in various orders. The late 1970s and ‘80s offered the raise of the Choose Your Own Adventure books and the computer games. Moreover, Netflix has already taken a similar approach with a few of its children shows, while HBO showed Steven Soderbergh’s “Mosaic”, that enabled the events to be viewed from different points of view. 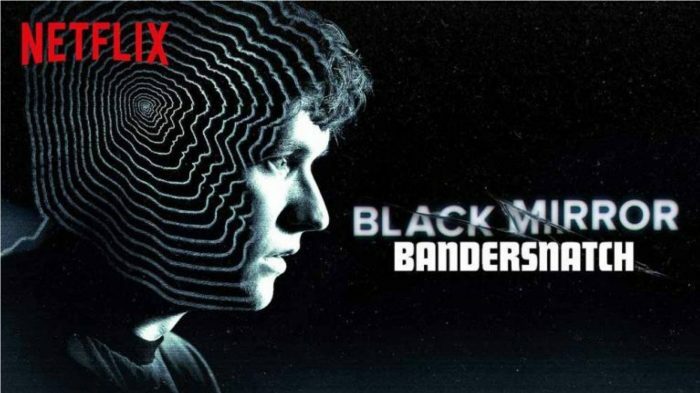 Still, Bandersnatch fits perfectly the Black Mirror’s style. The creators (written by the show’s creator Charlie Brooker and directed by David Slade who also directed one of the show’s episodes – “Metalhead”) are mindful of their interactive, self-aware play with the convention based upon raising questions about morality, limitations of the medium and the responsibility of the possible influence on the viewer. Nevertheless, the free choice seems uncomfortably illusory anyway. However, the creators bare this illusion in various ways to break down the fourth wall. Ultimately, Bandersnatch remains an effective play with the audience based on intertextual levels, although, in the end, it may seem as only another story of deleterious ambition. Contextually it appeals to not only numerous Easter Eggs from both pop culture and Black Mirror itself, but also to the ‘80s nostalgia along its references to Pac-Man and music, where you’re actually the one that chooses what kind of music is going to be played. Even though (spoiler alert – if it can be said about something that can play out differently for each of us) it can be a bit disappointing that every conclusion leads Stefan to be left in a quite dark situation, we have to remember it’s Black Mirror. “I make decisions for you” Stefan’s computer tells him in one of the Bandersnatch version. As it is – let’s repeat it – Black Mirror, it’s largely a cautionary story that you may be experiencing yourself. What can be more Black Mirror than Bandersnatch then?